Sample drinks like Rum Punch and Pineapple Passion from Koloa Rum (the only distillery on the island), sake from Cherry Co., and locally brewed beer from Kaua’i Beer Company and accompanied by local cuisine from popular Kauaʻi food trucks! Must be 21 years and older. ​The Mana Time Trial is a competitive bicycle road race for cyclists and triathletes. This 10.8 miles TT starts and ends at MacArthur Park at Kekaha Beach and is open to ages 10 years and older. For additional information, please contact Mary Williamson at p2mKauai@gmail.com or visit pedaltothemeadow.com. Join us at the Historic Waimea Theater for a full day of cultural documentaries and films from the 36th Hawaiʻi International Film Festival. Ticket prices are $10 General Admission OR purchase a $40 WFF Pass for all of the screenings + pupus. We continue our island tradition of “commUNITY” by honoring a person for the aloha they give all year long! This year’s recipient is Keith Yap, Chairman for Kauaʻi/Niʻihau Burial Council, Treasurer for Hospice, Treasurer for Leadership Kauaʻi and Treasurer for West Kauaʻi Business & Professional Association. The evening will showcase a Nā Hōku Hanohano (Hawaiʻiʻs “grammy”) award winning performers of traditional Hawaiian Music. Ticket price is $10 General Admission. For tickets and additional information contact Puni Patrick at 808/651-5744 or aloha@waimeatowncelebration.com. Come for an entertaining evening of storytelling at the Historic Waimea Theater beginning at 6:30 pm. The $10 price for admission includes TALES told by Kathy “Tita” Collins, one of Hawaiʻiʻs best story tellers and TREATS of cupcakes from Kuppycakes by J, Lokelani Ice Cream from Super Duper II and malasadas and cream puffs from Ginaʻs. The largest traditional rodeo in all of the Hawaiian Islands features events like the Paniolo Po’owalu and Double Mugging which are unique to Hawai’i Rodeos. Team roping on Friday (10 AM – 5:30 PM) is free for spectators. Saturday & Sunday’s events begin at 10 AM. Admission on Sat/Sun is $5/Adults; $3/Child (5-12 Years). Food concession and crafts will be available. For additional information, please contact Kevin Blackstad at 808/645-1510 or kelkob@hawaii.rr.com. A 2-day ho’olaule’a of continuous LIVE entertainment on a big stage, local food booths, games and rides for the keiki, craft vendors and a beer garden that includes wine and Rum Punch and Pineapple Passion from Kaua’i’s own Koloa Rum. Admission is FREE! Teams from across the State of Hawaiʻi compete in a double elimination tournament (ASA rules with a few modifications). Admission for spectators is FREE. Food concession at the Waimea Athletic Field will raise additional funds for the Antone Balocan Memorial Fund. For additional information, please contact Don Ouderkirk at 808-482-0886 or donald.ouderkirk@yahoo.com. This is the largest 3-on-3 basketball tournament on the island and benefits the Westside Basketball Club. All games are held at the Waimea Canyon Park Basketball Courts on the corner of Huakaʻi Road and Kaumualiʻi Highway. The cost is $10/player (school division) and $25/player (adult division). Late Registration is $30/player. Adult Male Teamsʻ Late Registration is at 5 pm on Friday with games from 6 pm – 9 pm. Youth Teamsʻ Late Registration is 8 am on Saturday with games from 9 am – 4 pm. For additional information, please contact Dino Pabre at 808-286-2064. Traditional Hawaiian outrigger canoes race along the Waimea shoreling competing in the Century (+300), Half-Century (+150) and Quarter-Century (+75) Divisions for Men, Women and mixed crews. Lunch will be provided to all paddlers and the Awards Ceremony begins at 1:00 pm. A food concession will be on site and admission is FREE. For additional information, please contact Dana Miyaki at 808-332-7625. Make a lei that a cowboy would be proud to wear on a cowboy hat and enter it in 1 of 2 categories: “Most Beautiful” (use only fresh materials) and “Most Unique” (any material is acceptable). Lei are to be dropped off between 7 am – 9 am on Friday and judging until noon. All lei will be available for viewing from noon to 6 pm on Friday and 10 am to 4 pm on Saturday. Awards will be given at 3:30 pm on Saturday. 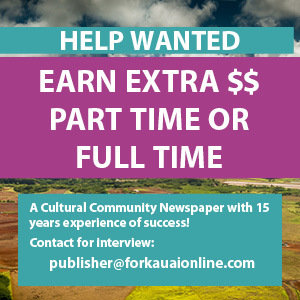 For additional information, please contact Aletha Kaohi at 808-338-1332. The 40th Annual Captain Cook Caper Run benefits Kaua’i Police Activities League (KPAL). Cost is $30/Adults and $25/ 17 years and younger. (Late Registration is $40.) Register on Friday at the Heritage of Aloha Hoʻolauleʻa (Old Waimea Mill Site) from 4:30 pm – 10:00 pm. Late Registration is Saturday at the Waimea Plantation Cottages from 5:30 am – 6:30 am. For additional information, please contact Sergeant Anthony Morita at 808-635-6011. Lappert’s Ice Cream Eating Contest is FREE to participate. Sign up at 11:30 am on Saturday next to the big stage at the Old Waimea Mill Site. The contest begins at noon. Age categories are as follows: (1) 5 to 8 years old; (2) 9 to 15 years old; (3) 16 to 25 years old; (4) 26 to 35 years old; (5) 36 to 54 years old; and (6) 55+ years and older. For additional information, please contact Candy Barr at 808-338-1522. Sign up on Saturday from 10 am – 12:45 pm at the Information Booth at the Old Waimea Mill site. Rules are (1) 3 minutes maximum per song; (2) 1 song per entry; (3) Soloists only, no groups allowed; (4) Judged on presentation, tone, showmanship, difficulty of song and overall performance. Only ʻukulele talent will be judged, not singing. Age Groups: Up to 6th grade; 7th to 9th grade; 10th to 12th grade; and Adults. Prizes: Every player will walk away with a prize! An ʻukulele will be awarded to the “Best ʻUkulele Picker” in memory of Byron Hahn-Morin. For additional information, please contact Carrie Newcomb at 808-338-1332. Island activities, hotel stays and Kauaʻi-made-products will be available to bid on to support the preservation of the Historic Waimea Theater. Cash and credit card payments will be accepted. Mahalo to all of our local businesses for their support! For additional information, please contact Darlene Schneider at 808-335-4670.